Some of the oldest links to our past are fraying at the edges. Many of the items in the State Collection are over 100 years old and starting to deteriorate with age. While we can’t always stop this deterioration we can slow the process through treatments, repairs and correct storage in a dust, moisture and pest-free environment. 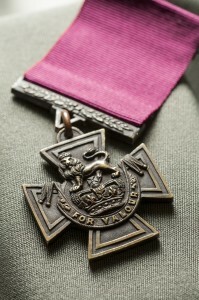 The Victoria Cross awarded to Private Paddy Bugden.One of the most valuable pieces in the State Collection is the Victoria Cross (VC) posthumously awarded to Private Patrick 'Paddy' Bugden in 1917. The VC is the highest recognition of valour in war awarded to those serving in the Commonwealth’s armed services. Paddy Bugden enlisted in the Australian Imperial Force on 25 May 1916 and trained at Enoggera in Queensland, before leaving for embarking for England in September, and from there, the Western Front. He fought in the Battle of Bullecourt and later, the second phase of the battle of Polygon Wood, performing many gallant acts including rescuing wounded men from No Man's Land. Bugden was killed by shell fire during one of these rescue missions. More stories about Paddy Bugden’s life and bravery can be found within The Courage of Ordinary Men exhibition at Queensland Museum. The Hunslet locomotiveThe Hunslet 4-6-0 T locomotive (459 KB) is a significant piece of Queensland’s rail history. Built in 1916 in Leeds, England, the Hunslet was used in France to maintain supplies of food and ammunition to troupes serving on the Western Front during World War One. Following World War One the Hunslet was rebuilt and exported to Queensland for use in the sugar industry. During the next 43 years, the Hunslet hauled sugar cane to the North Eton Mill for crushing. 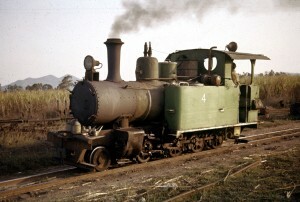 The Hunslet was retired from active duty in 1964, and was donated to the Queensland Museum Network in a state of disrepair 2005. Thanks to support from our generous donors, the Hunslet locomotive is being restored to its former glory by Queensland Rail’s specialist heritage rolling stock team onsite at The Workshops Rail Museum.